If you’re bitten by the wanderlust bug, it can be hard sometimes to shake off the intense craving to be out there, exploring, wandering the world. Planning a trip but but have no idea where to go to next? 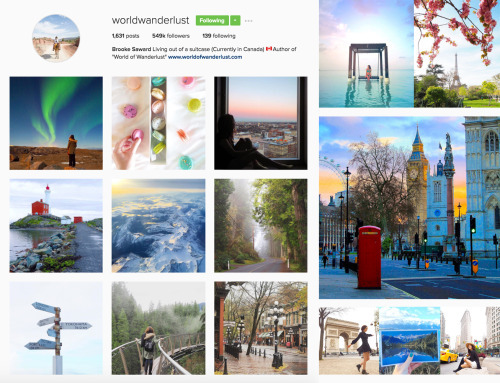 There’s no better place to get inspired than Instagram. Glean some inspiration from these female travel role models, who have effortlessly proven that travel is no longer a world solely inhabited by men. 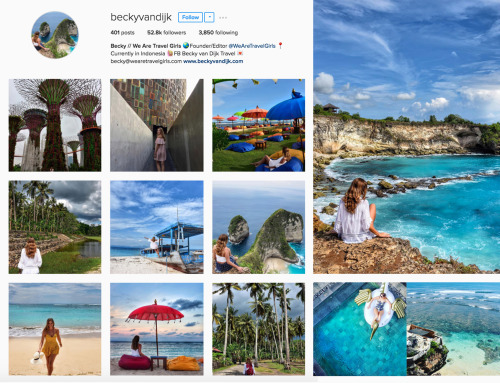 For a serious dose of wanderlust, follow these free-spirited female travel bloggers on Instagram – you might find yourself booking some plane tickets right after! 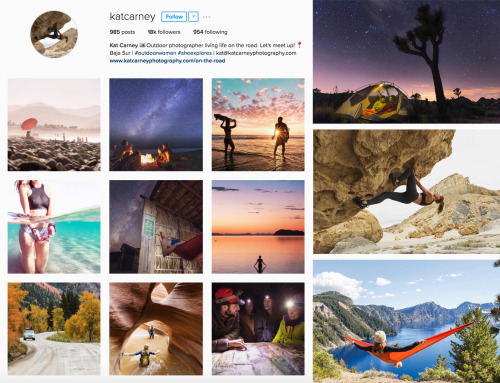 Kat Carney’s feed is full of beautiful landscapes, star trails, and jaw-dropping sunsets. We don’t know how she does it, but every single picture is incredibly gorgeous. She’s not an outdoor photographer for nothing! Kat documents her adventures canyoneering, rock climbing, surfing, snorkelling… basically anything and everything outdoorsy. Becky Van Dijk is an avid traveller who has scoured over 50 countries across the globe. Her Instagram page strongly embodies sisterhood and fellowship between female travellers, and it’s no surprise that she is also the co-founder and editor of the @wearetravelgirls community (one of many communities she’s established). This is where fellow female travellers are encouraged to share their travel stories and post pictures with the hashtag #wearetravelgirls – a great platform from which to draw inspiration and courage for your adventures. This is one Instagram profile we’re head over heels with – just look at that colour scheme! There’s not one photo that’s out of place with the gallery’s luscious beige and emerald tones. 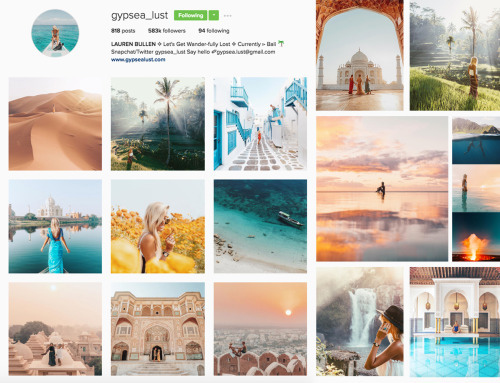 Lauren Bullen’s @gypsea_lust profile is for the girl who dreams of the ocean breeze, warm sands, and lush jungles. Just browsing her Instagram feed makes me feel like booking a trip to a tropical island already! But Lauren’s page isn’t just limited to posts about the sea, as she wanders all across the globe – think Morocco, Greece, India… and the list goes on! 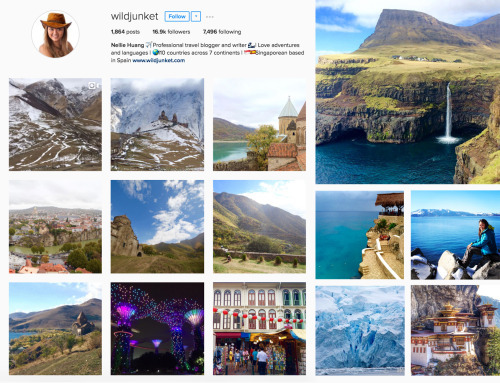 Nellie Huang, better known as @wildjunket, is a Singaporean currently based in Spain, and her Instagram page @wildjunket is like a page out of an adventure travel book. Kyrgyzstan, Jamaica, Africa, Taiwan… you name it, she’s been there! She’s had wild, off-the-beaten track adventures in 110 countries (and counting) across all seven continents, with plenty of beautiful photographs as proof of her travels. Indonesian traveller Melissa decided to log her food adventures around the world on her Instagram page. 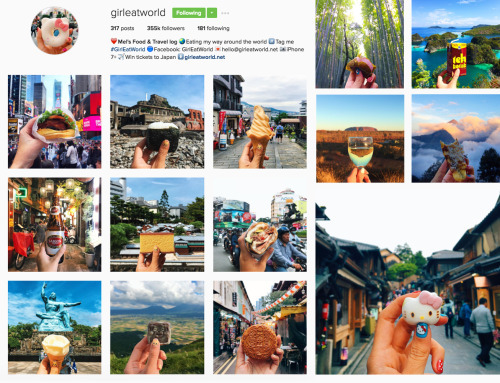 Her photos adorably combine two of the best things in life: food and travel, and what started as a fun photo series soon turned into a huge hit. Melissa is now based in Singapore, but is truly a citizen of the world with the amount of travelling she does. Just looking at her page makes us hungry! 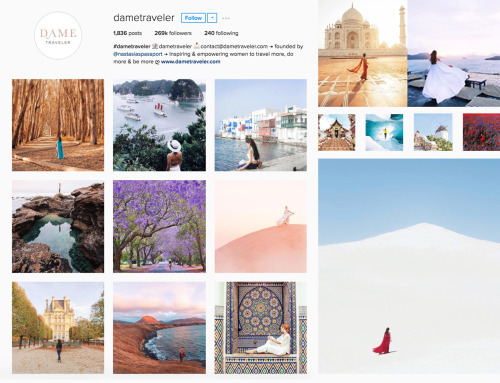 @dametraveler is not so much a mere profile, as it is a vast community, one which bears hopes of inspiring and empowering women to travel more. Whether you’re an outdoors enthusiast or a shopaholic, you will definitely find something you resonate with on this page. This site and Instagram page is founded by Nastasia from @nastasiaspassport, who is also a passionate traveller. Brooke Saward went from her university degree to a full-time life of travel, and never looked back! She is only 24 years old, but has already written her own travel books and built her own business from the ground up. As her Instagram profile says, she lives out of a suitcase and is constantly on the road – and her colourful photographs are testament to that. She regularly hosts meet-ups as well (even in Singapore! ), which are great if you’re a travel blogger looking to connect with other like-minded individuals. Nothing stirs up our wanderlust more than beautiful pictures of places we’ve yet to explore. 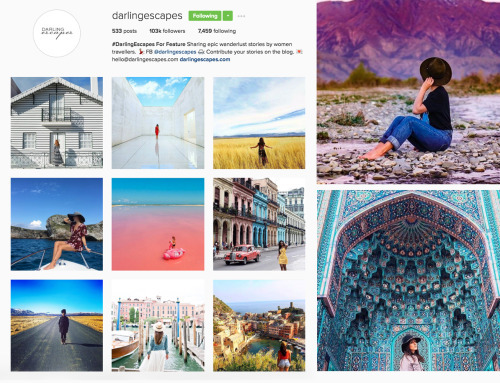 @darlingescapes is another brilliant Instagram community, founded by women, for women, which showcases breathtaking photographs of cityscapes, lush tropical jungles, outback adventures, and more – all skilfully taken by female travelers.